All our medical services require appointments by referral (initial consultation/second opinion). Firstly, call us by phone for a consultation. Please send us the Form of Provision of Medical Information, CD-R with image files (CT, MRI, and PET, etc. ), imaging findings, results of pathology and biopsy, and a record of radiotherapy (for those who underwent radiotherapy before), etc. As soon as we receive the necessary information, we judge if the radiotherapy at our clinic would be appropriate. 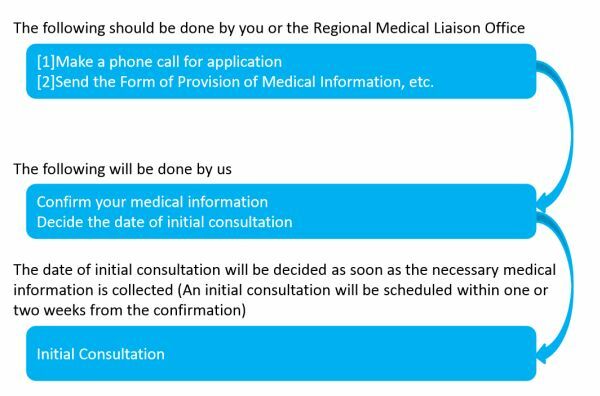 Upon judging that radiotherapy is appropriate, we decide the date of initial consultation and notify you. Please note in advance that it may take some time to notify you. When an indication for treatment is decided after the initial consultation we will make an appointment for your visit during the treatment period. Please note that the date you desire may not be available due to our schedule. We would appreciate your understanding and cooperation. We do not have an inpatient facility. Please feel free to consult the reception if you come from afar and wish to stay at a nearby hotel. * What do we Mean by Medical Information? Medical Information means information about your disease. It refers to materials that include the following. Treatment history including surgeries and medication, etc.